The EUR/USD peaked at 1.1357 as FED’s Mester reiterated that the Federal Reserve has now adopted a dovish stance. Mester said that economic growth could slow this year, while she sees inflation near the Fed's target of 2.0%. Earlier in the session, the Euro hit a daily low of 1.1274 as US President Trump suggested tariffs on car imports, which might negatively affect the EU car industry. In economic news, the February ZEW survey showed that business sentiment improved modestly in Germany and the EU, printing -13.4 and -16.6 respectively. Today, the EU will release February Consumer Confidence, with a -7.8 forecast vs. -7.9 previously, while the FOMC will release the Minutes of its latest meeting, where investors will search for clues of whether the FED will raise interest rates this year or not. The Euro tried to break below 1.13 (S1) in yesterday’s session, but the buyers stepped in and retested the 1.1350 (R1) resistance level. 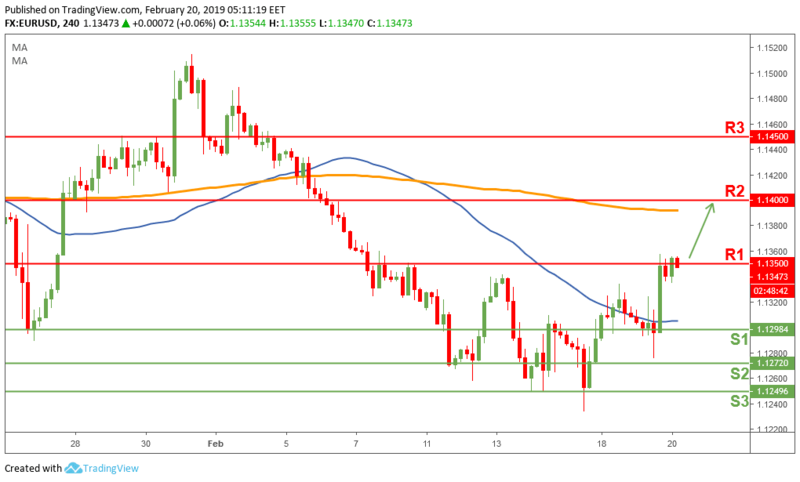 Currently, price is trading just below the 1.1350 (R1) resistance, a break above it could take prices towards 1.14 (R2) and the 200-day moving average. Alternatively, the sellers need to break below 1.13 to regain control.